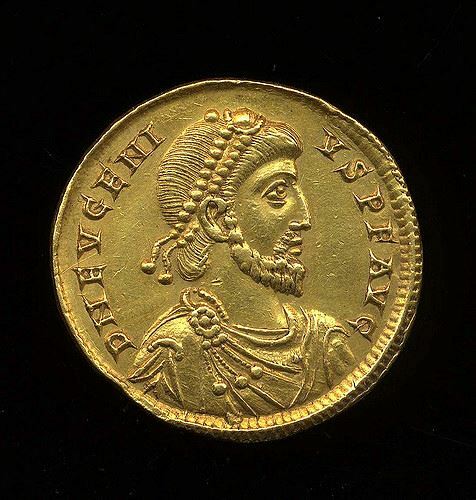 Flavius Eugenius was a usurper in the Western Roman Empire against Emperor Theodosius I. Though himself a Christian, he was the last Emperor to support Roman polytheism. A former teacher of grammar and rhetoric, as well as magister scrinorum, Eugenius was an acquaintance of the Frankish magister militum and of the de facto ruler of the Western Roman Empire, Arbogast. Following the death of Valentinian II, Arbogast, who had probably been the cause of Valentinian II's murder or suicide, elevated Eugenius to the purple on 22 August 392. Theodosius I did not recognize Eugenius, however, and defeated both him and Arbogast in the Battle of the Frigidus on 6 September 394.